I am proud to say that I have known the people who founded Wyoming Catholic College for many years, long before its Lander, Wyoming campus opened for students. I have visited Wyoming regularly over the years, and spoken at the college. I will be giving a retreat for the students during Holy Week this year. So I feel some of the pride that the students and faculty of the college feel about the award the Vatican has bestowed on Dr. John Mortensen, associate professor of theology and philosophy at the college. On my last visit to the college, I had the privilege of sitting in on a philosophy class that John taught. 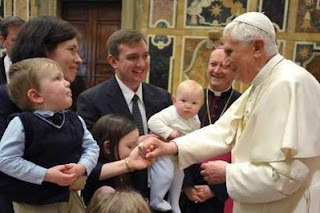 The sight of John and his lovely family receiving an award from Benedict XVI warms the heart. If you or someone you know has high school age children and pondering where these children might be given the finest possible liberal arts education, look into Wyoming Catholic College. It is a remarkable place.